through my hands: Let's make Hexies! Have you joined the hexie craze? No? Well, I'm here to remedy that right now. 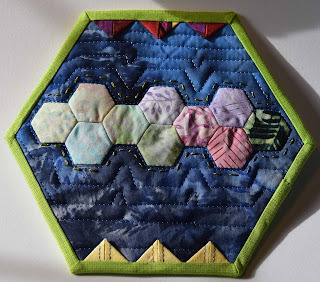 In case you are a new visitor to my blog, I'm a bit enthusiastic over the hexagon shape. So much so that I designed a block of the month and taught it at a local quilt store in 2015. It was so much fun seeing each student's monthly blocks. Our souvenir for Canada is the perfect "dip your toes" hexie project. There are only 10 hexagons to make. I have videos for you to watch on knotting, basting, and joining hexies. The videos are posted them on my website HERE. Note: there are many ways to baste hexies: glue baste, through the paper and through only the back. Choose the method that you prefer. For me, I prefer through the paper. Those prairie points are cute!!! Thank you Terry. They were fun to make.